Let’s be honest; we know all the reasons why it makes sense for Portandia to end right now. It was a decidedly Obama-era show that satirizes things that seem inconsequential in the Trump age, and really, there’s only so many ways you can point out that Portland is a hipster-friendly city. At the same time, though, the show has given us plenty of hilarious sketches and great little moments, and the thought of life without Fred and Carrie’s quirky charm can’t help but be a bit of a bummer even if it’s ultimately for the best. That’s why it was a thrill to see the show go out on a high note, with a delightfully ridiculous episode that features the show’s off-beat humor at its finest. Every story arc here is centered around the Portland marathon, which The Mayor (Kyle Maclachlan) is desperate to get absolutely right. Specifically, he obsesses over the shape of the marathon route. When his aid gives him a shape that he likens to “a soggy cornflake,” he comes up with a better idea: have the whole thing be shaped like a rose, which lends the episode its title. In a solid shot at Portland’s gentrification, the way he manages to make this happen is with a series of quid pro quos that all involve keeping new condos out of town. This thread has plenty of laughs, but more importantly, it sets us up for the fun off seeing the rest of our beloved characters prepare for the marathon. As for Fred and Carrie, they decide to participate as a means of distracting themselves from all the depressing news in the world (a nice way of nodding to the Trump horror without mentioning him by name). This leads them to a gym where they meet a trainer named Bailey, who lavishes Carrie with praise and attention while completely ignoring Fred. The way she is so completely overt about this leads to some laughs, with the best bit coming from the twist ending: Bailey faked a crush on Carrie to motivate her, while she also immediately recognized that Fred responds to positively to being ignored (he seems perfectly okay with learning this about himself). Well, they both finished the marathon, so she must being doing something right. The best joke in this arc comes at the very end, when Bailey claims to be “married to the gym,” which we find out is actually a muscle-bound dude who calls himself The Jim. Okay, it seems kind of dumb when you write it out, but in the moment, it works. We also see Toni and Candace for the final time, although Toni only appears briefly. Candace is hosting an impossibly friendly English woman through Airbnb, and quickly becomes enamored with her. Candace is perpetually on the edge, but here, we see her at her most tweaked. She freaks out when Dolly leaves early to train for the marathon, then attempts to sabotage her by allowing her to sleep through it. What’s intriguing here is how entirely self-aware she is about the type of person she is; she speaks openly about her hatred and cynicism, and seem’s to find Dolly’s perpetual optimism both off-putting and alluring. Realizing her mistake, she chases Dolly around the marathon in her car. Somehow, she manages to do this without injuring any of the other runners who seem perfectly fine moving around her. Dolly ends up winning the marathon because Candace chasing her causes her to run faster than she ever has in her life. She accepts her apology, but also never wants to see her again. She also feels good about finally being able tell someone off after apparently being nice to people for her entire life. While it would have been nice to see Toni after she returns, this was a great thread nonetheless, and a fitting goodbye to one of the show’s most wonderfully (and horribly) eccentric characters. As for The Mayor, he ends up having a harder time keeping his beloved Rose Route than he expects. The bridge gets shut down midway through the race, and it’s up to him to re-open it before the runners come. How does he manage this? By making agreement with an old witch who lives by the bridge. Unfortunately, promising to get rid of condos won’t satiate, and the Mayor’s magic powers are useless against her. So, his only recourse is to allow her to take his place as mayor, as he vanishes into the air. He congratulates Fred and Carrie on finishing the race, and in the episode’s funniest moment, they point out to him that because they’re actually running the race, they can’t see the rose, and really, it wouldn’t have been any different if they raced any other way. That doesn’t matter to The Mayor; he vanishes into the air immensely proud of himself for pulling the Rose Route off. His disappearance was a nice bit symbolism for the departure of the show itself; that they allude to their own demise in such a perfectly awkward way is a prime example of Portlandia knowing exactly what it is. After eight quality seasons, Portandia is ending without overstaying its welcome, or its place within pop culture. As a series finale, “Rose Route” works quite well. It’s a little bigger than usual, with one event unifying every story arc, but it avoids being too grandiose for its own good. 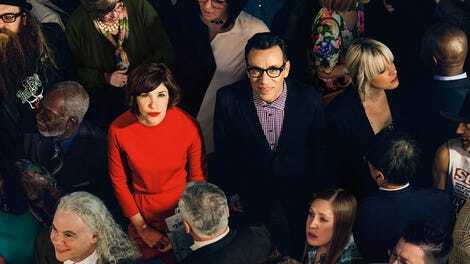 Portlandia is far to twee of a show to make a huge deal of its final episode, and Fred and Carrie were smart enough to know that. With Portlandia over, we can only wonder what its two stars will do next. My guess is that Armisen will continue to thrive in the world of stand-up and sketch comedy, and I don’t know about you, but I would love a new Sleater-Kinney album full of some high-quality anti-Trump rage. 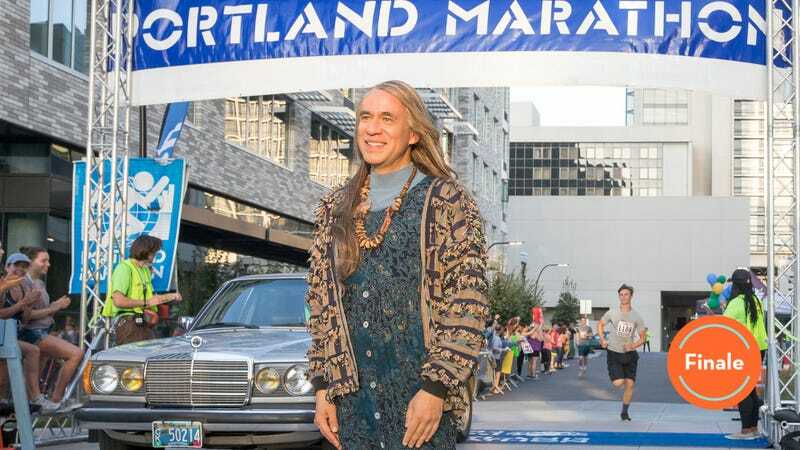 As for Portlandia, it will go down as both a loving tribute to and an adroit satire of life in Portland; one that, for a half hour a week, 10 weeks a year, made us feel like it was our home, too. While looking at his phone, Fred briefly thinks that the entire country of Turkey is dead, only to find out that it was simply an individual turkey that had died. The marathon scenes are all beautifully filmed, and give a really great idea of what a marathon is like in a major city. Am I the only one who actually thought Dolly would have a heel turn and end up being even crazier than Candace? Would love to hear some of your favorite sketches in the comments. Personally, I know it’s an obvious choice, but it’s probably the original Feminist Bookstore sketch. I mean, the idea of teaching a class on how to organize a Tucker Max protest is just so perfect. or at least it was, when people actually cared about Tucker Max.